Back home in Wisconsin from Cambodia for a few months, the Director of Education at Liger Leadership Academy in Phnom Penh, Jeff Holte and I were talking Deeper Learning and diving into projects of all kinds. Where do they come from? How do you capture the inspiration? How do you get the courage? Where do you find partners? How do you build the right team? And…how do kids build their inquisitiveness, problem finding/solving, and autonomy? I have been gathering project ideas since I was eleven and discovered my first project in the garden. Bees. Collecting, pinning, classifying, treasuring them! Jeff has a crew of 110 boarding students grades 7-12 and a staff committed to finding projects wherever they are hiding. Last year, they captured over 1,000 learning experience ideas, including over 400 projects. This year, they are implementing more than 200 of those projects…from simple and local to complex and distant, they are all about driving discovery, learning, and autonomy. The most extraordinary of them? Designing and launching a satellite! When 13-year-olds work on inspiring projects; they planned, wrote, and did the paintings for this book. So where are all these projects discovered? Jeff and I agree…they are almost always hiding in plain sight. Liger kids live in a jungle. Plants and animals routinely invade their beautiful campus, becoming natural partners in a project: The Wildlife of Cambodia. Really, it does not sound that exciting, does it? Lots of us have designed “animals of our region” projects, right? The astonishing parts of this project were the New York artist partner, the amazing student watercolors and the engaging essays that became a real book that students raised the money to publish…along with what they had to learn and do to actually publish a real book. Like much Deeper Learning, this project led to another project, another book, The Cambodian Economy, that students wrote, published, and promoted. Now every student in Cambodia reads this book in their own classrooms. Talk about discovery, learning, and autonomy! 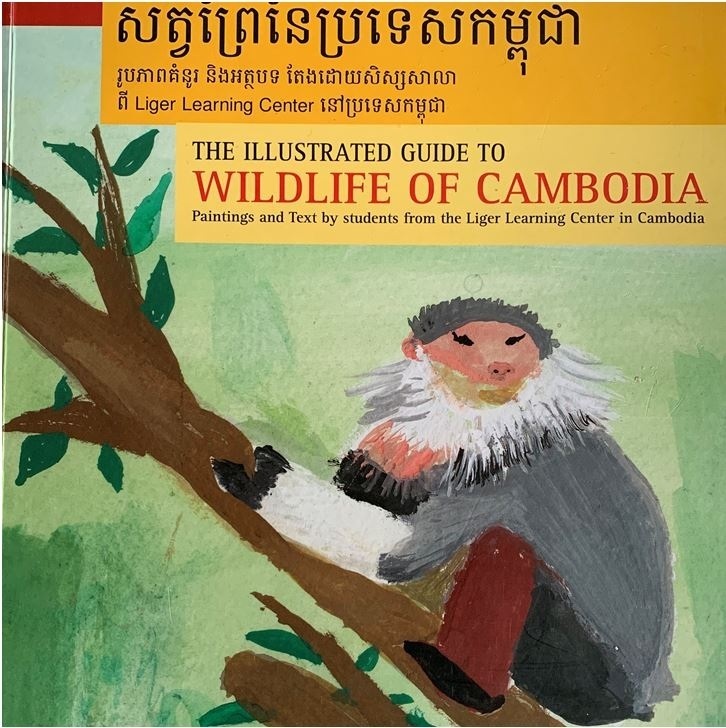 Liger students wrote, designed, raised capital and published this book that now is used throughout Cambodia. Projects are all around us. We just need to look, see, listen, hear, engage, share. Paul Jaeger of Minnesota New Country School talks about using advisory time and relationships with students for “listening good ideas into existence”. https://education-reimagined.org/conversation-aaron-grimm-paul-jaeger/). What are your students thinking about? What do they love and celebrate? What are their day-to-day challenges? What are they worrying about? What do they hope? Structuring time to explore these questions or other big ideas of interest to students creates a space of reflection, engagement, and possibility. Problem finding and projects live in this space, as does the curiosity and inquisitiveness of your students. The conversation leads to questions that drive a project. And that leads to creating the linked components of a rigorous project. These raw materials of a project idea are waiting for refinement. What is there to be discovered in the idea? Where is the learning, the skills, and how will students’ curiosity be stretched? What are the questions that emerge: the big idea that is the essential or driving question and the smaller questions that will guide the project and link to tasks and activities? How will the idea be authentic and rigorous, real world and deeply engaging? How will the standards and skills be explored and mastered? And how will all of that link to assessment and evidence of learning that will show skills growth and learning-along-the-way and demonstrate student proficiency? Check out and download PBL Project Plan Linked Components materials on Foundry’s website at https://www.projectfoundry.com/generate-great-project-ideas. They will help you and your students take your hiding-in-plain-sight project ideas and turn them into rigorously designed projects that go where you planned and beyond. For a deeper dive into project planning design and implementation, join Jeff Holte and me for a webinar exploration on January 29, 3-4PM CST. Jeff is Director of Education at Liger Leadership Academy in Phnom Penh, Cambodia, an extraordinary residential, experiential learning school for 7-12th grade Cambodian children who come to the school not yet speaking English and graduate ready for higher education, problem solving and entrepreneurship anywhere in the world. Discover more at http://www.ligeracademy.org.